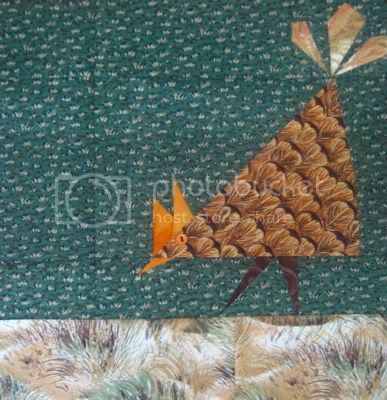 Quiddity Quilts: Chickens are Silly! Despite the fact that I really don't like paper piecing, the chicken theme for Cat's blocks really called to me to make these. =) The silly chicken block was originally supposed to only be 8" but I enlarged it to fit the criteria (Cat wanted 10" blocks). 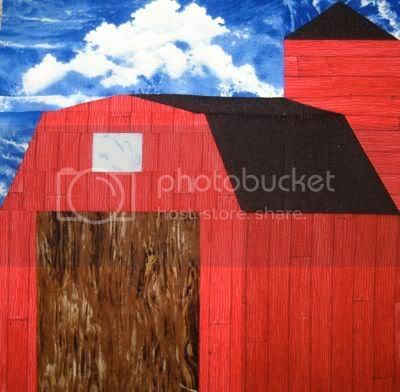 And of course chickens need a bit of shelter - not a coop exactly but a giant red barn! Chicken luxury at its finest. ;^) I kept trying to dye the fabric piece I used for the side of the barn with teas and coffee's to get it to come out darker. I fail at dying stuff. It came out a little darker, but not much. Not as much as I wanted it to anyway. Ah well - time was up so I went with it. At least it smells like a cafe!